Syracuse closed out its home portion of the 2K Classic benefiting Wounded Warrior Project with a hard-fought 84-70 win over Morehead State. The win sends the Orange to next week’s Championship Rounds presented by Continental Tire at Madison Square Garden on a two-game winning streak. 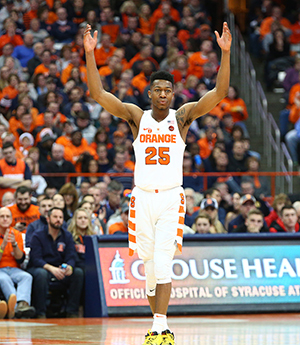 Tyus Battle (pictured) led the Orange with 23 points. He was joined in double figures by Elijah Hughes, who posted 22 points and eight rebounds, Oshae Brissett, who had 17 points and 13 boards, and Paschal Chuckwu, who tallied 14 points, 10 rebounds, and six blocked shots. All those rebounds resulted in a 51-37 advantage for Syracuse. The Orange also won the foul shooting game, going 25-of-30 from the line against the Eagles’ 7-of-12 effort. Morehead State was paced by Jordan Walker, who was 9-of-18 from the field, including 6-of-10 from three, in recording a game-high 24 points. Lamontray Harris had 14 points and nine rebounds and Malik Green scored 12 points. The 2K Empire Classic benefiting Wounded Warrior Project resumes on Sunday when Green Bay travels to Iowa and UConn hosts UMKC. Syracuse, UConn, Iowa, and Oregon will travel to New York to participate in the Championship Rounds presented by Continental Tire of the 2K Empire Classic benefiting Wounded Warrior Project. The Orange and Huskies renew their storied rivalry in the first semifinal round game on Thursday, Nov. 15 at Madison Square Garden, followed by the Ducks and Hawkeyes. The consolation and championship games will then be played on Friday, Nov. 16.